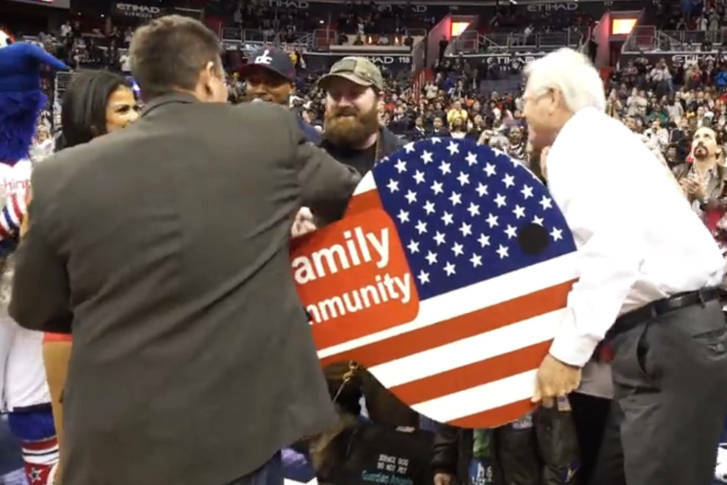 A local veteran and his family got a big surprise on Friday, Veterans Day, during the Washington Wizards and Cleveland Cavaliers' game at the Verizon Center. WASHINGTON — A local veteran and his family got a big surprise on Friday, Veterans Day, during the Washington Wizards and Cleveland Cavaliers’ game at the Verizon Center. Operation Finally Home, an organization that provides mortgage-free homes to military heroes, and firms Miller and Smith and Newland Communities, presented U.S. Army Sgt. Timothy Goodrich and his family with a brand-new house in Stafford, Virginia. Groundbreaking for the house will begin Monday, Nov. 14, and the delivery date is scheduled March 2017. Goodrich served in Iraq and Afghanistan. His outpost was attacked, and he suffered injuries to the right side of his jaw and body. He received a Purple Heart, an Afghanistan Campaign Medal with Campaign star and the Iraq Campaign Medal with Campaign Star for his service, a news statement from Operation Finally Home said. “It’s not just a financial worry that’s off our plate, it takes his whole quality of life to a whole other level,” Jacqueline Goodrich said. “I’m eternally grateful for the kindness others,” Goodrich said. In July, Goodrich and his family received $10,000 worth of furniture from Bassett Furniture in Sterling, Virginia and Freedom Alliance.